Although small in stature, students at Lura M. Sharp Elementary School are putting on a larger-than-life performance as “Annie Kids” takes the stage later this month. 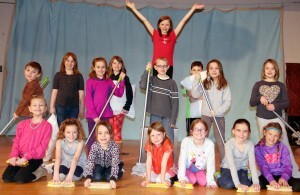 Cast members of the Lura M. Sharp production of “Annie Kids” prepare for the upcoming performances during a recent rehearsal. Pictured is “Annie” (Emily Gareau) surrounded by fellow student actors in a scene from the orphanage. The show, under the direction of music teacher Stacey Landas, is a spin on the classic story of little orphan Annie. Set in a New York City orphanage in 1930, Annie‘s charisma is contagious as she searches for her parents who abandoned her at the orphanage run by Miss Hannigan. Annie receives help from other children in the orphanage and escapes to embark on an exciting adventure in the Big Apple. According to Landas, as the adventure unfolds, the audience will be captivated by the 50 second through fifth grade students who will be on stage singing, acting and delivering a fun-filled show. Performances are set for 7 p.m. March 13 and 1 p.m. March 14 in the Lura M. Sharp auditorium. Tickets cost $3 per person and children 4 years old and younger get in for free.